The only time sheep tend to enter our minds when we’re in the land of slumber is when we’re wrestling with a restless night, forced to imagine a succession of the white fluffy fellows leaping over a fence. If Enter OrcKid has its way, however, those seemingly benevolent creatures will soon be the subject of more than a few nightmares. Indeed, let it not be said that Enter OrcKid – currently a Windows Phone exclusive developed in Manchester with the aid of Creative England – doesn’t come with a healthy sense of humour. Housed inside some frankly stunning visuals designed to give the hardware packed inside your Nokia or HTC the kind of workout you just don’t see all too often on Microsoft’s platform, Enter OrcKid is a modern day hack-and-slasher where the order of the day is to take down those aforementioned evil sleep en masse. Occupying an essentially 2D based environment, your role is to take charge of OrcKid – a young but determined orc warrior – as he sets out to rid the world of as many sheep as possible. In practical terms this means tapping on the screen in something of a frenzy as the enemy approaches from both sides. Survival is the aim here. Controls are essentially focused around a few basic movements – tapping either side of the screen, for instance, will cause OrcKid to lash out in the appropriate direction, while swiping in either direction will see him dodge out of direct danger. At least initially, however, sheep tend to take turns to take a swipe at our little Orc, with a handy exclamation mark appearing over their heads when they’re about to make their move. As such, success is a case of staying flexible and launching counter attacks when your rival is in the midst of instigating an assault of their own and is therefore most vulnerable. Simply tapping one side of the screen consistently before switching back will soon seen you taken down in quick time with the enemy taking pot shots at your behind. Aside from the actual combat – which manages to be both as simplistic and hectic as it sounds – there’s also treasure to hunt for. Swiping down towards the group will see OrcKid dig for said trinkets. An initial swipe launches an indicator directing you to the goods before further swipes actually dig it up. This is no game of hide and seek, however: actually finding said treasure is a straightforward task, but engineering the time and space needed to dig it up without being taken out in the process is a real skill. However, once these two elements have been mastered – the combat and the treasure hunting – Enter OrcKid seems to have very few tricks up its sleeves to keep things entertaining other than simply chucking more enemies into the pot. There’s no faulting the delivery: Enter OrcKid’s slightly chunky nature is full of visual highlights, and there’s a definite satisfaction that comes from seeing the limbs of your foe fly across the screen as you merrily slice them off. Nevertheless, when it comes to actual depth, Enter OrcKid is found wanting. There are definite hints at grander things to come, however. Developer Me, We Studios’ push to enable players to customise OrcKid using the currency they’ve amassed, choosing both what he wears and his weapon of choice, suggest thought has gone into how the game can better engage the player. As things stand, however, it almost feels like Enter OrcKid is all foundation and no flair: there’s a base game there, but more needs to be done to transform it into something truly memorable. 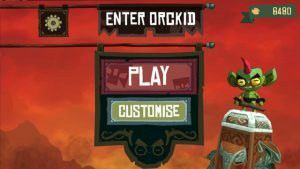 As such, Enter OrcKid feels like a game unearthed from a bygone era of smartphone gaming, with substance somewhat playing second fiddle to style – as early iOS developers discovered six years ago, simply charging the player with tapping the touchscreen in rapid succession does not an entertaining game make. There’s enough here to amuse those looking for something slick and shiny to put their new Windows Phone through its paces, but Enter OrcKid doesn’t currently bring enough to the table to suggest this is anything more than a short and sharp lamb supper. All the fluff without the meat in the middle, if you will, Enter OrcKid has charm and character in spades, but we’d hold off parting with your cash until it has something a little juicier to snack on. One of the better looking games on Windows Phone, Enter Orckid’s take on hash-and-slash is a solid enough proposition in short bursts, but it currently lacks the depth to really stand up as a top class adventure long term, despite the obvious draw of suicidal, evil sheep. The post Enter OrcKid appeared first on Trusted Reviews.